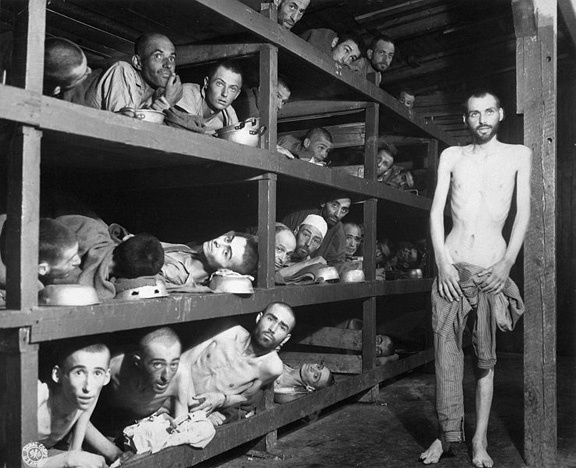 The famous Buchenwald photo — is that Elie Wiesel or a 40-year-old man? 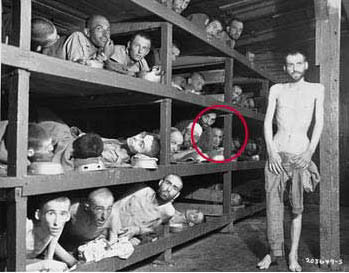 This morning I googled “famous photo of Elie Wiesel at Buchenwald” and the first website that came up in the search results was the website “Elie Wiesel Cons the World” which has a wealth of information about the famous Buchenwald photo, which you can read here. Is this the face of 16-year-old Holocaust survivor Elie Wiesel? Or is this the face of a 40-year-old man? Elie Wiesel wrote in Night that he got out of his hospital bed at the Monowitz camp in Auschwitz and joined the death march out of the camp on January 18, 1945. He also wrote that he became sick three days after the liberation of Buchenwald on April 11, 1945 and was confined to a hospital bed for 2 weeks. Did he also get out of his hospital bed and go over to barracks #56 to get into this famous picture? Elie Wiesel was an orphan after his father died at Buchenwald, and he was allegedly in barracks #66, the orphan’s barracks, when the camp was liberated.